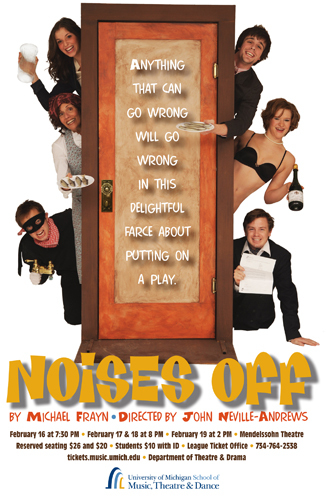 Okay, so its not the first time you have probably seen Michael Frayn’s “Noises Off” in Ann Arbor (it makes regular appearances on our various stages)– but its by far the best production you’ll see, thanks to John Neville-Andrews hilarious staging currently on-stage at the Lydia Mendelssohn Theater, presented by the University of Michigan, Department of Theatre and Drama. Comprised of student performers, and guest performer Equity actress Naz Edwards, the farce flies by in what seems much shorter time than it’s 2 hour 40 minute running time might otherwise suggest. In three acts, the first sets the stage at the final rehearsal of a British farce “Nothing On” pre-tour (in the best insider joke in the show, the actors don’t know if it’s a dress rehearsal or a tech rehearsal); the second Act takes place during a performance a week into the run from the vantage point of backstage as personal relationships begin to unravel and the sight gags start to fly fast and furious; and Act Three seven weeks into the tour, from the audience vantage point, as the show has started to unravel. It’s tremendous fun and this is a five-star production. John Neville-Andrews keeps the action moving swiftly. This is a very difficult show to direct and this production is a Neville-Andrews masterwork of slamming doors, perfectly timed sight-gags, and some brilliant personal touches. He does a particularly good job with the women in this production, never allowing them to disappear into the background which can happen with this show. Those who have never seen the show before (hard to imagine in Ann Arbor, but obviously the case from some of the blank reactions of the senior older folks sitting around me) might need a second viewing to take it all in. Gary Decker’s set is terrific (and the backstage view marvelous). Katelyn Rouse’s costumes look great, and Andrew Lott’s lighting design looks clean and crisp both onstage, backstage, and offstage – in particular when the set revolves and the occasional glimpses of the show “onstage” shine through the central window from “backstage” without ever losing focus on the action backstage. Finally — do not bypass the program insert — a hilarious spoof of the program for “Nothing On”. There, you will learn that “Cinemagoers saw Brooke in The Girl in Room 14, where she played the Girl in Room 312″, and that Selsdon had “several good supporting roles in Hollywood, including stand-in to Robert Newton”. Hilarious stuff that — and the funniest evening I have had at any theater in years.